In his closing remarks as keynote presenter at the Groundswell conference in Powell River on January 29th, 2014, Al Etmanski said, “There wasn’t a lot of how going on today. The answer to how is who, and the answer to who is you, and … the answer to you is us.” In other words, it is up to all of us to bring about any changes we hope for in our community. During the conference activities, participants expressed a strong interest in building bridges among existing efforts. In particular, conference participants appreciated the opportunity for connections between elders and youth, among different cultures, and across sectors – and are eager for more. Being a community in social and economic transition, new realities can be co-constructed by creating such avenues for connections. And if we take Al Etmanski’s words to heart, then we all have important parts to play in fostering these connections. It has been nine months since that conference, and there are just another two before our municipal election. I’ve been wondering how we might all participate in creating the conditions that can foster the priority themes that emerged during the conference? Where do we each see ourselves in relation to creating a bright future for this region, regardless of our age, abilities, and professions? It can take a lot of work and money for a small business to promote itself, and it can often feel highly competitive in a geographically isolated community like ours. A group of businesses on Marine Avenue, however, decided to reframe this dilemma as an opportunity for collaboration and mutual promotion. Creative Rift Studio and Gallery already understands the value of partnership, with over 80 local artists selling their wares in the space. But this summer the co-owners expanded this notion of partnership outside of their own doors to benefit the entire main drag with a collectively created pamphlet, promoting the strip to Vancouver Islanders as a wonderful way to spend the afternoon within walking distance of the ferry. Rather than seeing rising ferry fares as an obstacle, they saw it as an opportunity to reach a niche of people who might want to walk on the ferry and spend a pleasant day strolling down Marine Avenue enjoying the shops, restaurants, and views along the way. In terms of Groundswell priority themes, this shift from competition to cooperation helps to foster a diverse economy, enhance links between public spaces and transportation, eliminate sectoral divides, and cultivate beauty and art. Are there ways creative initiatives like this one can be supported by policy-makers in our community? How might we create a culture in which we all take it upon ourselves to see our own wellbeing as intricately connected to that of our neighbours, as this initiative demonstrates? This multi-sensory arts festival brought the streets alive and had something for everyone, with both ticketed and free events. There were workshops, video and audio installations, music performances, and even a steampunk fashion show. Local businesses in Townsite and other food and art vendors got to enjoy an extension to their regular tourist season, and the opportunity for intergenerational and intercultural engagement in public space was created. 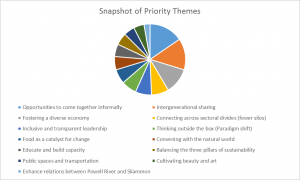 It is clear then that many of the priority themes articulated by Groundswell participants are supported with this fun, two-day event; in fact it doesn’t take too much creative thinking to suggest that (at least indirectly) perhaps all of them were. Given the different hats we all wear, how might we support this and related efforts? Beyond participating in the event as either an artist or a patron, are there other ways we might remove barriers to success and pave the way for initiatives like this to thrive with a little less effort in years to come? Recognizing the contribution this kind of event makes to tourism, for instance, might there be partnerships with the city or even other municipalities or BC ferries that could increase the reach of the event? After all, if events draws people to the community, hotels and restaurants may also benefit. Might they be able to work together to coordinate things like travel, dining, and accommodation during this or other local events? Recognizing that Powell Riverites love to give back, Sean Melrose has launched the Powell River Community Investment Corporation – a way to invest money for a rainy day which also supports local businesses and profit-shares with local non-profit and charitable organizations. In other words, the money works twice and stays in the community. In terms of the priority themes above, this initiative has the potential to foster a diverse economy, facilitate connections across sectoral divides, demonstrate ‘outside the box’ thinking, and balance the three pillars of sustainability. But in order to succeed, it really requires that we – as individual community members and decision-makers within businesses and organizations – participate. What potential might be realized in this community if those of us who have the capacity to do so collectively commit to invest locally? Such a commitment could even serve to shrink the wealth gap in this community. After six years of collaboration with researchers at the University of British Columbia, Elsie Paul launched her book Written as I remember it: Teachings from the life of a Sliammon elder on May 24, 2014. The launch itself brought 150 people of all ages together, and now the book is being enjoyed not only by local community members, but also by students, academics, and interested citizens from around the province and beyond. Both the content of this book and the process by which it was written provides a remarkable and poignant example of the connections between local and global realities. It demonstrates how what happens in the life of a particular person holds great meaning for others, and also how ideas and policies from outside have very concrete implications for local people and communities. In these ways, we can understand the importance of all we do as having social and economic implications not only for those in our immediate circles, but even for generations to come. Elsie’s story, and the way she shares it, can serve to enhance our sense of responsibility for each other in every act – small and large. 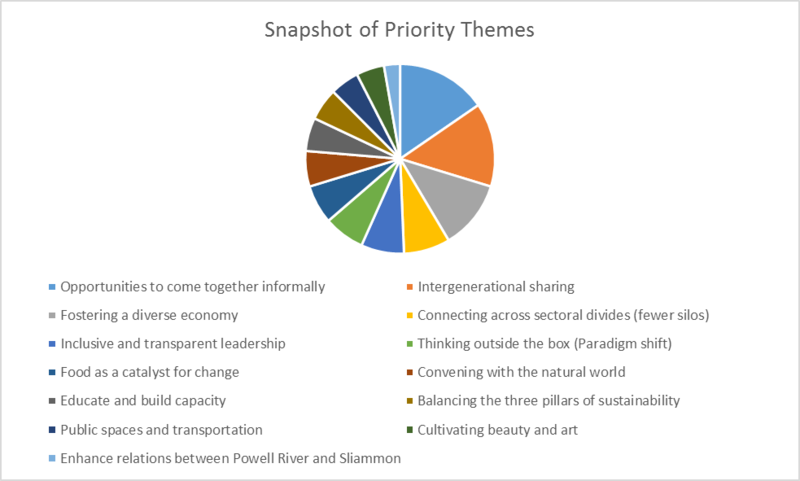 Intergenerational sharing and enhanced relations between Powell River and Sliammon were important priority themes for those who participated in Groundswell, and this book makes massive contributions towards these goals, particularly if we choose to engage with it meaningfully. In doing so, we can also see it contributing to the themes of food as a catalyst for change, educating and building capacity, convening with the natural world, and balancing the three pillars of sustainability. We are fortunate to have access to such a rich resource in our community as the wisdom of Elsie Paul and other elders – from Sliammon, from Powell River, and from other corners of the world. We all benefit when events and initiatives in our community do well. These are just a few snapshots of the many creative ways people are already coordinating efforts in order to support each other. As the months since the conference roll by and the municipal election draws near, I find myself wondering how we as a community can become even more coordinated in these efforts. What might it take to create more infrastructure to support this kind of citizen engagement around social and economic development? How can we cultivate a culture of mutual responsibility? How might we each find our own places in this larger puzzle, and see our daily choices as significant contributions to the future of this community? The examples above – and so many more – suggest to me we are already on our way. This entry was posted in Interesting Events, Learning and Reflections, Uncategorized on September 18, 2014 by janetnewbury. This weekend I had the opportunity to talk about Powell River and our project, Defining Diversity: Creating Community (DDCC), at the Royal Roads University Leadership Conference in Victoria. I met some amazing people, including Barry Posner who autographed his book for me. (yes – I was thrilled!) Preparing for this presentation gave me the opportunity to reflect on what we have been doing together and why. My background is in leadership, largely in community living organizations. I realized DDCC has given me the opportunity to cross pollinate well known organizational leadership concepts and ideas to this community change initiative. For example, a foundational belief behind DDCC is that our social and economic well-being relies on empowering and welcoming greater citizen involvement. This means breaking down historic divides and opening our hearts and minds to diverse views and opinions. It means inviting all citizens to contribute their gifts. Effective leaders know that genuine collaboration requires that we listen deeply to all voices, including those that have been traditionally unheard. It requires us to create safe space for dialogue. It requires active management of the ego and a conscious letting go of personal power in order to empower the group. Kouzes and Posner (2012) emphasize that the keys to creating a collaborative culture are establishing a climate of trust and facilitating long-term relationships (pp. 215-240). Defining Diversity, Creating Community does just that. Janet Newbury and Ruby Barclay co-facilitated the Oct 3-4, 2013 delivery of the DDCC course. 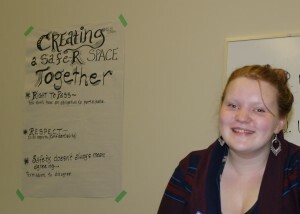 They created a safe space for participants that nurtured trust and made it easier to forge new relationships with one another. The collaborative culture that developed allowed new ideas to emerge. After such a powerful experience, we each adjust our internal compass and act just a bit differently because of our our time together. We see ourselves, each other, and our community just a bit differently. We leave inspired to contribute to our shared future. Kouzes, J. & Posner, B. (2012). The Leadership Change: How to Make Extraordinary Things Happen in Organizations. (5th ed.). San Francisco: Josey-Bass. This entry was posted in Learning and Reflections on October 7, 2013 by Alison Taplay.